Editing videos was once considered a task reserved for computers featuring high-end graphics and with the help of paid editing software costing thousands of dollars. If you just want small editing then you can go with free editing software too.. While things have not changed much when it comes to heavily professional video editing such as editing a Movie or TV shows, there are now options available if your requirements are a little low. If you only need to edit videos for personal usage or for professional usage with fewer requirements such as for YouTube then you can do it with your everyday PC and even with your smartphone too. However, while it’s now easier to do basic video editing with your smartphone or PC, it’s not the same when it comes to finding the right app for getting the task done and it’s even harder if you own an android phone. The first entry in our list would be FilmoraGo which is one of the best free video editings software for Android out there. The app packs all the basic features such as Trimming, Merging, Rotating and Cropping videos. There are also plenty of advanced features compared to many other editors in the free category such as adding texts or a mp3 file. It also has a feature called themes which are basically a set of relative features which are automatically applied to the video if you choose one. The features coming under the themes includes a filter, an effect, a title, and music. Don’t worry though since you can remove the features you don’t like one by one after an applying a theme from the sub menu. Although all these features are good, the most noteworthy one is its watermark feature, which doesn’t add anything during your video and adds a small clip instead at the end which saves your video from getting ruined. 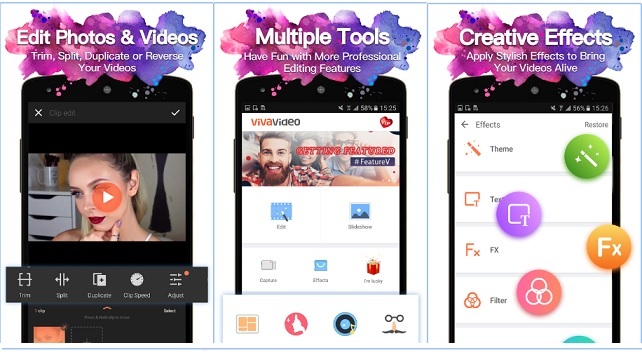 The next one in our list of Top 5 Best video editing software for Android mobile is Viva Video, which is an app I have personally used many times. It comes with a very neat UI and all the features are very easy to use. One of the most notable features of the app is that it allows you to edit video under 2 different modes. The first is the Quick Mode which helps you to put together any kind of video easily without being a pro and without much knowledge of the app. For the ones who are looking for deeper editing, there is also a Pro mode, with the help of which you can take your time and edit the video frame by frame. Another cool feature is it’s built in camera, which not only lets you record normal video to edit them within the app but also lets you shoot the video with various effects making it much more fun. Although while it packs all the basic features, it’s a demo app which means it has limitations until you buy the premium version. The most notable thing is that it only allows you to make a video of up to 5 minutes, which a big turn off for many. KineMaster is the only paid app mentioned in our list of Top 5 best video editors for Android and believes me it’s worth it. KineMaster is a powerful video editor with some insane editing capabilities that you might not have thought were possible on a smartphone. The app has every editing feature you can think of finding in a premium video editor made for smartphones and some advanced features too such as adding multiple layers in the video. However, it works only in the landscape mode for fully utilizing the allocated space. Although as we mentioned the app is not completely free and is subscription based, instead of being a one-time buy which is a big problem despite all its features. There is also a free version with comes with limitations and a watermark added with every video which is not recommended. So unless you are ready to pay around $30 per year for it, you might wanna pass on this app. 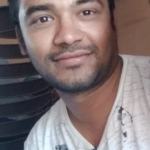 Overall KineMaster is an app for someone who edits videos professionally on regular basis with a high specs computer and is looking for a smartphone companion with which he can get stuff done from his mobile as well. WeVidoe is a unique cloud-based video editor which lets you edit videos saved in various cloud platforms such as Dropbox through your android smartphone. One of the biggest advantages of its cloud-based platform is that you can fetch footage from multiple sources online and you can also invite your friends to upload the footage from their device which you can use, This is an awesome feature because other mediums of receiving videos often lower the quality. Although the app is not flaw-free and it has some downsides too. The biggest one is that you need your video to be saved on a cloud platform and if you have to edit videos regularly and your internet connection is slow then this can be a real pain for you. Also, the free version limits the video quality which can be exported after editing which is a big no-no if you want to use them professionally. Some people also complain that the app is missing some basic music editing features but they would hopefully be added to the app in the upcoming updates. Overall due to its easy collaboration features and cloud-based platform, It’s a good app if you have to work with a large team and want the videos to be always available for you to edit. Adobe is one of the most well-known app developers and you can’t deny that its photoshop app has become a brand in itself. What’s lesser known is that they also have a smartphone app for editing videos which you should definitely try. 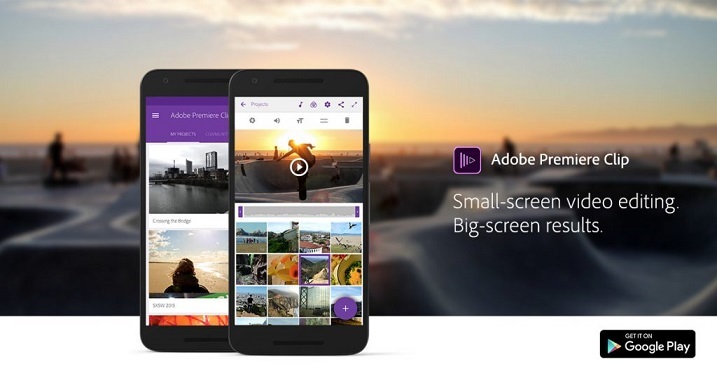 Adobe Premiere Clip is the final entry in our list of Top 5 best video editing apps for Android which is basically a toned down version of its PC companion to help you do basic video editing from your mobile. It supports fetching content from both cloud-based platforms and local storage and is a cross platform app means it’s available for both Android and iOS. The app has all the basic functions but you will be disappointed if you are expecting advanced features given in the PC version of the App. Although it’s still good if you are looking for an app from a well-known developer which can rely on. Overall, if you find the options given in other video editing apps for android very confusing and you want something which is easy to use and can be used seamlessly with any lag then you should definatly give a try to it. This was our list of Top 5 best video editing software for android mobile. Which one of the mentioned software fits your need? Is there any other video editor you believe deserves to be on this list? Do let us know your thoughts in the comments section below.